Super League will revert to a top five play-off system from 2019, after its proposals for change were voted through. The top five system previously ran from when the play-offs were introduced in 1998 until 2001, after which it was changed to a top six system. When Super League grew to 14 teams in 2009, the play-offs were controversially extended to eight teams, before reverting to four teams when the Super 8s format was introduced in 2015. St Helens coach Justin Holbrook has expressed concerns over the format, due to the fact that it means the team that finishes top of the table only plays two games in four weeks. The teams finishing 4th and 5th play in an Elimination Final in week one, together with a Qualifying final between teams 2nd and 3rd. It’s season over for the loser of the Elimination Final, while the winner goes on to play the loser of the Qualifying final in the first semi-final. 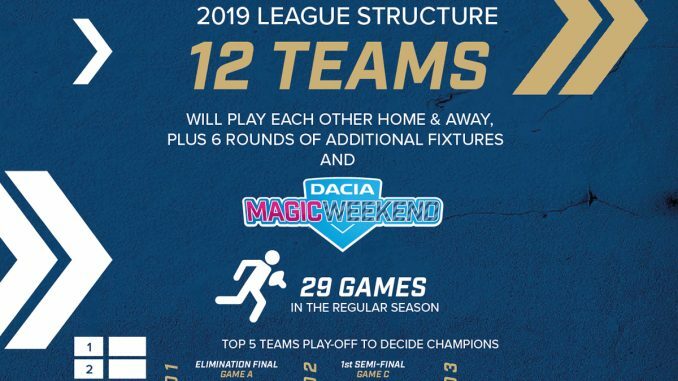 The winner of the Qualifying final travels to the 1st placed team for a place in the Grand Final, with the loser of that match then going on to play the winner of the first semi-final in the Preliminary Final in week three.